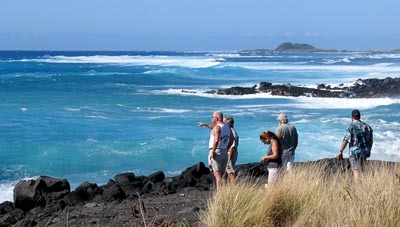 Folks watch the wave action near Honokohau Harbor. Beautiful weather with clear skies, light winds, snowcapped summits and lots of wave action due to a storm system west of the islands. How big were the waves? This picture isn’t a good representation, it’s just a quick snap with my little PowerShot s500. When the tide was higher they were doing tow-in surfing off Spencer Beach Park, lots of surfers all along the Kona-Kohala coastline. You can see some photos of a kayaker caught in the impact zone at Kawaihae Harbor on my SportsShooter.com page, for awhile anyway until I change the images out.